Laura and her husband, Jeff, met at Narbonne High School. After college and grad school, they moved to Redondo Beach, District 2, in 1990. In 1992, they bought their home in District 5. They raised their two sons and, like most RB families, volunteered for all the organizations the boys were involved with - AYSO, Boy Scouts, RUHS Cross Country & Track and PTA. Both sons went to Redondo Beach Unified School district since Kindergarten then graduated from Redondo Union High School in 2009 and 2012, respectively. Laura enjoys drawing and painting, while both Laura and Jeff love the outdoors and have been known to ski, hike and bike ride. In 2011, Laura was elected to the RBUSD School Board. Economically, it was a tough time for the school district. RBUSD was only receiving about 80% of the budget it received in 2008. The reserve dwindled to save class sizes and teaching days. Raises were non-existent. Everyone – employees, the leadership team and the school board – had their healthcare benefits cut and everyone shouldered healthcare increases. Efficiencies were needed – Laura knew there was a community of parents and education supporters that were willing to fundraise and help the school district. 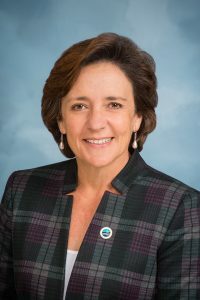 Laura advocated for RBUSD to change school site plans to include outside resources such as Redondo Beach Education Foundation (RBEF) and the Parent Teacher Association (PTA). Fundraising dollars are now coordinated with the school site plan to efficiently target the district goals of educating the ‘whole child’. Outside revenue is needed - With a fluctuating state budget, the school district took advantage of other operating revenue opportunities. For example, a lease arrangement for the Knob Hill property was approved in 2012 and will result in $614,500 per YEAR for RBUSD. Unrestricted! Envisioning the 21st Century Classroom – A task force was created to envision the 21stCentury Classroom. On August 28, 2012 the vision was presented and it was the beginning of a plan. Common Core and Smart Balance Testing –With the new state mandated Common Core Education, new testing requirements were revealed. RBUSD needed to improve the district’s technology infrastructure and give every child access to modern technology so they could be comfortable with the technology when they were tested. Laura led the successful Measure Q Campaign – Measure Q funds are being invested in the classroom and infrastructure while improving student access to computers and modern technology. In order to help the budget, Measure Q also provided for solar panels throughout the district saving the school district $500,000 per year. This savings will help the district withstand State budget fluctuations. Opportunities to save – Interest rates have decreased over the last several years and we took advantage of refinancing and grant opportunities. In addition, education funding has begun to turn around. Funding levels still have not adjusted to 2008 levels but they are very close. Laura and the school board increased our reserves and as a result improved the district’s credit rating. In total we saved Taxpayers close to $20Million. Laura Values Employees – Due to the poor school funding environment since 2008, the employees had not received a raise in 5 years. The board focused one-time money on reserves and maintenance but took advantage of the improved funding situation we paid all employees a long overdue raise.